A small group of patient research partners from all over Europe also participate in the project. The patient research partners are members of their national rheumatic patient organisations. Their involvement in the project is crucial, because they give the academic and industry partners feedback on the research work and an insight into the experiences of RA patients. Their input has always been an inspiration for the academic and the industrial researchers. Finally, the project directly involves specialists from the fields of genetics, ethics and patient and public involvement in helping to visualize and communicate risk following a positive biomarker test. The key objective of the TEAM consortium is to identify diagnostic biomarkers and disease mechanisms operating during the transition from health to full blown rheumatoid arthritis (1). In the preclinical phase genetic make-up and lifestyle factors act together, leading to a stage of systemic autoimmunity, characterised by the formation of autoantibodies. Later on, symptoms like arthralgia or morning stiffness may develop, without clinical evidence of synovitis (CSA, clinically suspect arthralgia). Synovial and bone abnormalities are detectable by ultrasound or MRI, as predictors of progression to undifferentiated arthritis (UA) and rheumatoid arthritis (RA). Until June 2016 EuroTEAM researchers have published more than 70 scientific papers in high impact journals. They document the results of this favourable cooperation. A list of these publications can be found on the project’s website: http://www.team-arthritis.eu/publications.html. ORGENTEC Diagnostika is the only diagnostic company that takes part in the project. Due to the sound knowledge, technical skills and experience of ORGENTEC’s R&D department in the development of laboratory test kits for rheumatology diagnostics ORGENTEC’s head of research, Dr. Holger Bang plays a leading role in workpackage 2 concentrating on blood based biomarkers. Findings from workpackage 2 have the potential to be transformed into products for diagnostic applications in the near future. Juarez M, Bang H, Hammar F, Reimer U, Dyke B, Sahbudin I, et al. Identification of novel antiacetylated vimentin antibodies in patients with early inflammatory arthritis. Annals of the Rheumatic Diseases. 2015;75(6):1099-1107. Based on the protein MCV (Mutated Citrullinted Vimentin), the well-known diagnostic marker for rheumatoid arthritis, they have developed a panel of post-translationally modified peptides that have the capability to bind autoantibodies in the sera of rheumatoid arthritis patients. These peptides are very similar, since they all use a peptide backbone of 12 amino acids derived from vimentin, where an arginine residue is replaced by different post translationally modified amino acids at position X, see figure on the right. Post-translational modifications of vimentin peptides. 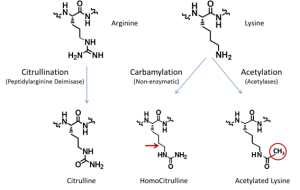 Red arrow indicating how citrulline and homocitrulline differ on an extra carbon atom that makes the homocitrulline side-chain longer. 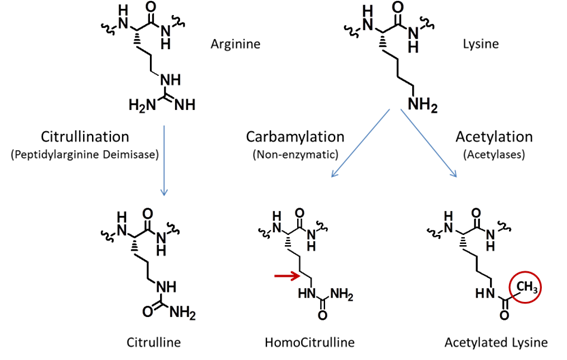 Red circle indicating addition of an acetyl group to lysine instead of an amino group. Acetylated lysine differs from homocitrulline only on one hydrogen and one nitrogen that is exchanged by carbon. The researchers looked for antibodies against citrullinated, carbamylated and acetylated vimentin peptides in the sera of patients with signs of very early inflammatory arthritis. In addition, they determined anti-CCP antibodies in the patients’ sera at presentation. At 18-month follow-up they assigned the patients to one of three outcome categories: rheumatoid arthritis, (RA), persistent non-RA arthritis and resolving arthritis. The proportion of patients seropositive for all antibody types was significantly higher in the RA group compared with persistent non-RA and resolving arthritis groups for all modifications. Left: Frequency of IgG autoantibodies against different modified peptides in sera of patients with anti-CCP positive or anti-CCP negative rheumatois arthritis (RA), persistent non-RA (PNRA) and resolving arthritis. Right: Number of peptides recognised according to outcome group. Patients who later developed RA had reactivities against a higher number of modified peptides and higher levels of antibodies against those peptides, representing a distinct profile compared with the other groups. Like citrullination, carbamylation and acetylation may be involved in the pathogenesis of RA by triggering the generation of autoantibodies and/or by generating targets for antibody responses in the rheumatoid joint. Another study had the aim to characterize the reactivity of different isotypes of autoantibodies against carbamylated antigens of vimentin in relation to established rheumatoid factor, anti-citrullinated protein antibodies (ACPA) and markers of disease activity in a population of patients with RA in Cuba (3). Combination of two tests for ACPA and anti-carbVIM IgM significantly increased the diagnostic sensitivity for RA and provided the best performance achieved so far in a Cuban cohort. In addition, the authors recommend to test seronegative patients for anti-carbVIM in the diagnostic workup of RA in Latin American countries. An ideal intervention in RA would be a preventive one. The novel modified antigens are detectable early in the disease process, at a time point when disease onset may be prevented by early therapy (studies addressing this issue are already under way). Thus, the novel modified antigens represent a first step on the road to this goal. RA Patients who already have developed rheumatoid arthritis and need treatment may benefit from therapy tailored according to their biomarker profile. 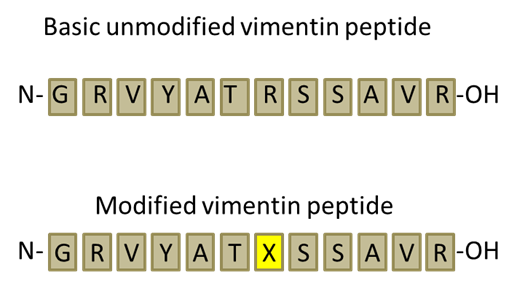 Some modifications may be used to predict response to drugs used for the treatment of RA (4), leading to the invention of companion diagnostics in RA therapy. The findings of Holger Bang and the partners in the EuroTEAM consortium will have an impact on how RA will be diagnosed and managed in the future. Concurrent analysis of multiple modified antigens may change the laboratory diagnostic process in RA towards a multi-biomarker approach, paving the way to personalized RA diagnostics and therapy. The EuroTEAM project is supported through the European Union’s FP7 Health Programme under the grant agreement FP7-HEALTH-F2-2012-305549. Gerlag DM, Raza K, van Baarsen LG, Brouwer E, Buckley CD, Burmester GR, et al. EULAR recommendations for terminology and research in individuals at risk of rheumatoid arthritis: report from the Study Group for Risk Factors for Rheumatoid Arthritis. Ann Rheum Dis. 2012;71(5):638-641. Lindenberg L, Spengler L, Bang H, Dorner T, Maslyanskiy AL, Lapin SV, et al. Restrictive IgG antibody response against mutated citrullinated vimentin predicts response to rituximab in patients with rheumatoid arthritis. Arthritis Res Ther. 2015;17:206.